As with all vernacular regions, South Florida has no official boundaries or status and is defined differently by different sources at different times. 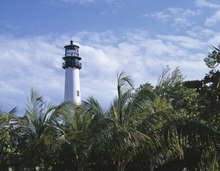 A 2007 study of Florida's regions by Ary Lamme and Raymond K. Oldakowski found that Floridians surveyed identified "South Florida" as comprising the southernmost sections of peninsular Florida. That area includes the Miami metropolitan area (generally defined as Miami-Dade, Broward, and Palm Beach counties), the Florida Keys included in Monroe county, and the interior region known as the Glades. Additionally, Southwest Florida, representing the state's southern Gulf Coast, has emerged as a directional vernacular region. Some respondents from as far northwest as the southern Tampa Bay area identified their region as being in South Florida rather than Southwest or Central Florida. However, the University of South Florida, founded in 1956, is located in Tampa. At that time, prior to the changes quickly brought by the Florida Constitution of 1968, south Florida was much less important politically, and the term was used more loosely. Tampa is not considered part of south Florida. Enterprise Florida, the state's economic development agency, identifies "Southeast Florida" as one of eight economic regions used by the agency and other state and outside entities, including the Florida Department of Transportation. Some entities alternately designate this region "South Florida". Its definition includes much of the same territory as Lamme and Oldakowski's report (except the Gulf Coast and much of the interior Glades region) as well as additional area. It includes Monroe County (the Keys) and the three metropolitan counties of Miami-Dade, Broward, and Palm Beach. The Miami accent is a regional accent of the American English dialect spoken in South Florida, particularly in Miami-Dade, Broward, Palm Beach, and Monroe counties. The accent was born in central Miami, but has expanded to the rest of South Florida in the decades since the 1960s. The Miami accent is most prevalent in American-born South Floridian youth. The Miami accent is based on a fairly standard American accent but with some changes very similar to dialects in the Mid-Atlantic (especially the New York area dialect, Northern New Jersey English, and New York Latino English.) Unlike Virginia Piedmont, Coastal Southern American, and Northeast American dialects, the "Miami accent" is rhotic; it also incorporates a rhythm and pronunciation heavily influenced by Spanish (wherein rhythm is syllable-timed). Lamme and Oldakowski identify several demographic, political, and cultural elements that characterize South Florida and distinguish it from other areas of the state. Many of its differences appear to be driven by its proportionately higher level of migration from the northern U.S. states and from the Caribbean and Latin America, particularly in the densely populated Miami area. Politically, South Florida is more liberal than the rest of the state. While less than 10% of people in either North or Central Florida felt their area was liberal, over a third of South Floridians described their region as such. 38% characterized the area as conservative; 26% as moderate. This tracks with South Florida's demographics, and Lamme and Oldakowski's findings parallel Barney Warf and Cynthia Waddell's research on Florida's political geography during the 2000 Presidential election. The economy in South Florida is very similar to that in Central Florida. Compared to the more diversified economy in North Florida, tourism is by far the most significant industry in South and Central Florida, with a much smaller but vibrant agricultural industry. Lamme and Oldakowski's survey also found some cultural indicators distinguishing South Florida. South Florida is the only region of the state where ethnic foods are as popular as general American cuisine. Additionally, while there was little geographical variation for most styles of music, there was regional variation for both country and Latin music. Country was significantly less popular in South Florida than in North or Central Florida, while Latin was more popular than in the other regions. The Anthony J. Catanese Center for Urban and Environmental Solutions at Florida Atlantic University notes the unusual growth pattern of South Florida. Unlike many areas with centralized cities surrounded by development, most of South Florida is preserved natural area and designated agricultural reserves, with development restricted to a dense, narrow strip along the coast. The developed area is highly urbanized and increasingly continuous and decentralized, with no particular dominant core cities. The center projects this pattern to continue in the future. 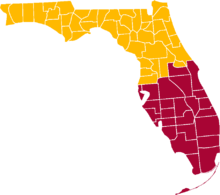 Over time, there have been numerous proposals for partitioning the state of Florida to form a separate state of South Florida. Such proposals have usually been made as political statement rather than serious attempts at secession. Reasons often stated are cultural, ethnic, economic, and financial frustrations with the state government in Tallahassee, which is in North Florida. In 2008, the North Lauderdale City Commission passed a resolution calling for a new state of South Florida to be formed from Palm Beach, Broward, Miami-Dade and Monroe Counties. In 2014, the City of South Miami passed a resolution in favor of splitting the state in half, with a northern boundary drawn to include the counties of Brevard, Orange, Polk, Hillsborough, and Pinellas (roughly the Tampa Bay and Orlando areas). In total, the proposed State of South Florida would have included 24 counties. This page was last edited on 7 April 2019, at 07:18 (UTC).